CASPER — Large corporations and government bureaucrats will often spend hundreds of thousands of dollars on soundproofing and sound conditioning for an audio studio. They’ll even spend tens of thousands of dollars simply on the consultants to tell them how to soundproof and sound condition a studio. That may make sense to you if you’ve got venture capital money to burn and don’t mind being out of business in a few years. It may also make sense if you’re working for the government because the money is someone else’s and you think you’ll never go out of business. But the rest of us have to make do with what we have. The advent of i.p. hardware codecs has allowed talk radio hosts to produce nationally syndicated shows from our homes. And people working for corporate radio are often called to do remotes in a variety of environments. You can buy portable devices that acoustically isolate a microphone, but using one is basically like sticking your head in a small box. That is not conducive to doing a good show, especially if you’re doing on-the-spot interviews with a variety of guests. Today I’ll show you how to temporarily sound condition a room in three minutes at no cost. This will vastly improve the audio reaching your microphone, and thus, your audience. First, you have to understand the difference between soundproofing and sound conditioning. Many people use these two terms interchangeably. However, they are not the same thing. 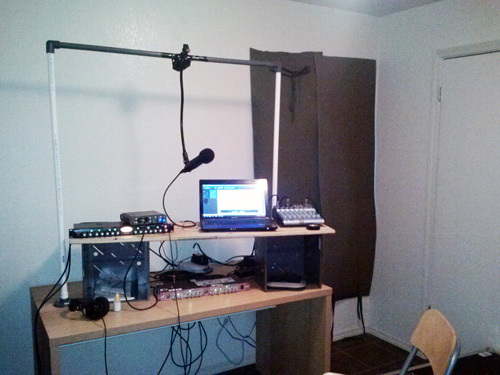 Soundproofing keeps outside sounds out and inside sounds in. Sound conditioning dampens native reverberation in a room. 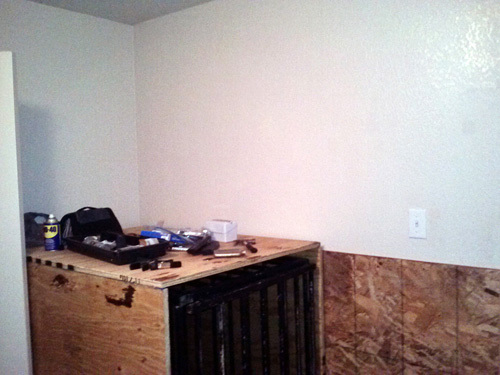 Effective soundproofing is a lot more expensive and complicated than sound conditioning. A concrete-lined bunker 40 feet underground would be totally soundproofed but not at all sound conditioned. Above, on the surface, you would likely not hear a grenade detonated in the bunker. In the bunker you would likely not hear a grenade detonated on the surface. That is, an underground concrete bunker is totally soundproofed. But an underground concrete bunker would not be sound conditioned at all. Any sound within the bunker would be awash in reverb. You would literally hear a pin drop and it would echo. 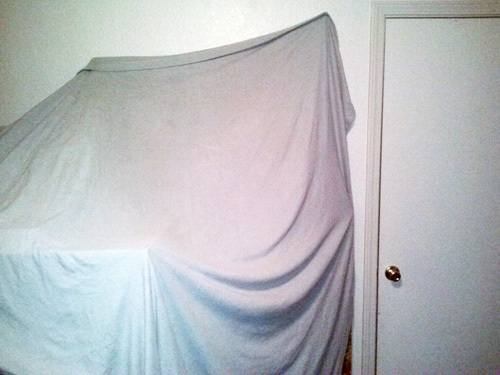 Conversely, a child’s blanket fort in a living room would be totally sound conditioned but not at all soundproofed. Speech inside the blanket fort would have no reverb and would sound studio quality. But the parents outside the fort in the living room would hear the children talking. And the children inside the blanket fort would hear their parents talking in the living room. Rooms that are professionally designed and constructed to be radio studios or recording studios are both soundproofed and sound conditioned. Today we’re only going to deal with sound conditioning, and doing it in a quick-and-dirty manner. That’s good if you have a room available that’s either naturally soundproofed, or just doesn’t have anything particularly noisy going on outside of it. We’re going to save soundproofing for a future article. Effective sound conditioning is the difference between sounding like you’re in a concrete bunker and sounding like you’re in a studio. I do the Freedom Feens radio show with my co-host Neema Vedadi. 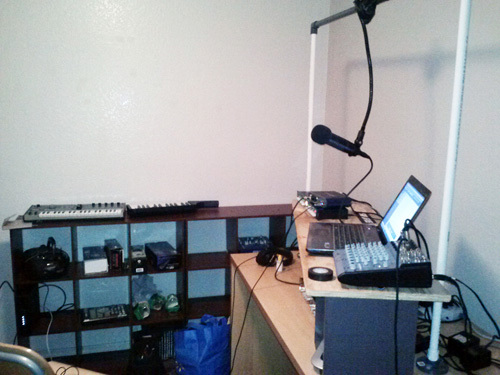 We pride ourselves on having better audio quality than many syndicated radio shows, and we do it on a far lower budget. We sound like we’re sitting together in a fabulous and expensive studio. But we’re not only not in a studio, we’re actually 1200 miles apart. I’m in Casper Wyoming; Neema is in Austin, Texas. Neema and his wife are expecting their first child, so they recently moved to a bigger place. 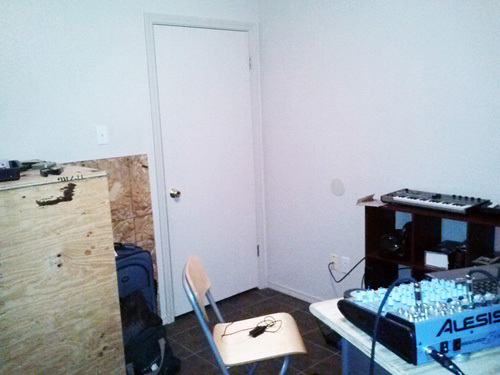 He hasn’t yet had time to fully sound condition his new home studio in a permanent way. I walked him through doing a quick-and-dirty three-minute sound conditioning treatment that greatly improved his sound. This will hold him over to do our show for a few weeks until he can sound condition in a permanent fashion. The biggest enemy of good sound conditioning is hard, bare, parallel walls. I simply had Neema hang up some blankets around the room in strategic places. They were also hung at slightly un-parallel angles. As you can hear in the above one-minute before-and-after audio example, the difference is noticeable. Three minutes of work took an empty room from sounding unprofessional to sounding professional. 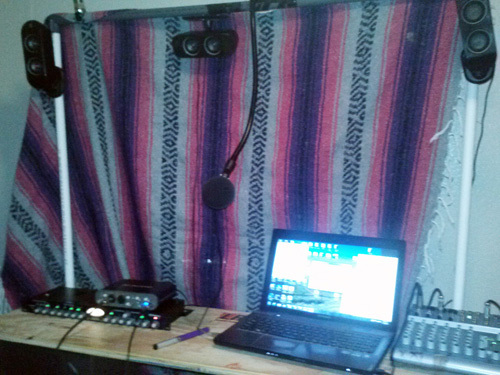 The blankets were hung behind the mic (an RE-320 with a foam windscreen), to the left of the mic, and behind his chair. It didn’t look pretty but it sounded a lot better. 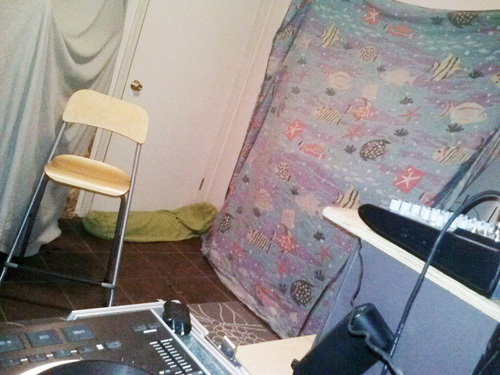 There was not a blanket hung to the right of mic, because that’s where the door to the room is. 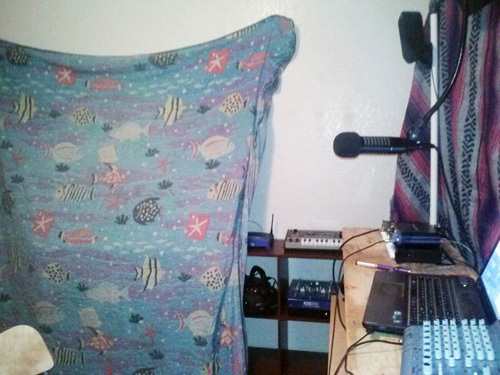 But three blankets tacked or draped on the walls vastly improved the audio quality in the room. Neema also put towels on the floor against the bottoms of the doors to keep sound from the kitchen from getting in through the one-inch space between the closed door and the floor. This may not be a pretty solution, but I’d much rather work in a rough-looking studio that sounds great than a great-looking studio that sounds rough. I can’t count the number of videos I’ve seen of syndicated radio hosts (and also podcasters) proudly doing their show from home in stately looking rooms. Unfortunately, these rooms often have tiled or mirrored walls, polished wood and glass surfaces or even stone or metal walls. This makes their show sound like they’re broadcasting live and worldwide from a public restroom. My quick-and-dirty sound conditioning method works great if you’ve just moved into a new house, or are doing a remote, and care more about your content than the way a room looks. In a future article, I’ll tell you how to do inexpensive and better looking permanent sound conditioning. It’ll look great, and cost about 120 dollars, but it actually won’t sound much better than the quick-and-dirty method. Great content should always be your first priority. But great audio should always be a very close second. Because if people have to suffer through your sound, they’ll change the channel and miss your message. BONUS AUDIO TIP: The inside of most cars have good soundproofing and good sound conditioning. If you ever have to do a remote or a recorded interview and cannot put up blankets, or you can’t find a room that is naturally soundproofed, do your remote from inside a stationary car with the engine turned off. And if you’re in a location with a lot of external noise, you can drive to a quieter location. Michael W. Dean is co-host of The Freedom Feens which is syndicated by Genesis Communications Network, and can be heard every Saturday and Sunday from 12:00 noon to 2:00 pm CT. Michael Dean also runs the free audio tip website Creamy Radio Audio. He can be emailed at mwd@michaelwdean.com.